Copyright © 1997 & 2000 by Michael I. Holmes. All rights reserved, not for reproduction. Click on the instruments to see larger versions of the image. Click on underlined text to see more pictures. Editor's Note: For a while it was believed that Nicola Calace came to the US and changed his name to Turturro. Photos have established that Nicola Turturro & Nicola Calace were two different men. However, they probably worked together in New York -- there is good evidence for that -- and both the families agree. For more about Calace, Click here. 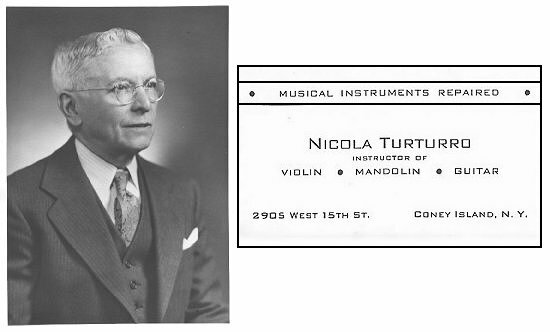 Nicola Turturro received several patents for musical instruments, three of them relating to ukuleles. Dated 1904, 1909, 1928, and 1929, it is the 1929 patent with which the bulk of this article is concerned. Additional information is welcomed. 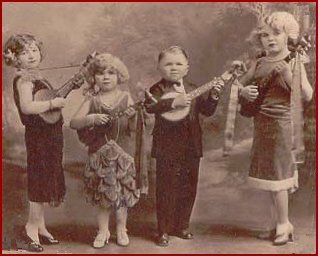 That patent was for a combination instrument, mandolin on one side, ukulele on the other, that was advertised as the "Turnover" as early as November, 1924 when they were marked "Pat. Pend." 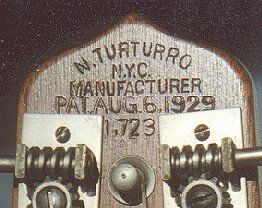 Once the patent was issued, the stamp was changed to include the patent and date, but the mandolin tuners cover much of the number. 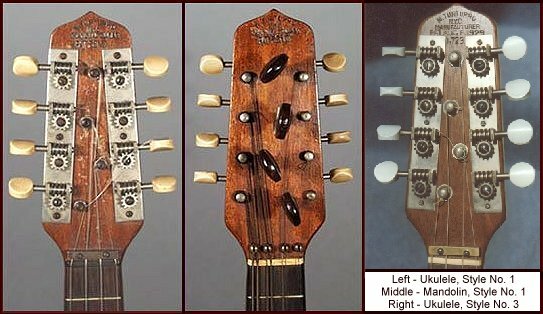 The picture to the left is of the ukulele side, showing the 4 strings and the back of the peghead with the mandolin tuners. Two (2) screws through a brass bar hold the uke strings down; it is not obvious in the small picture, but is just behind the nut and can be seen clearly in the enlargements. Four (4) screws and no bar serve the same function on the mandolin side. Click either picture to see closeups of the pegheads. In the picture to the right, the uke tuners protrude from the mandolin peghead, and the four screws to hold down the strings can be seen. Since the angle of the peghead is almost non-existent (see below), something was needed to improve the string angle, and both arrangements work well. The mandolin strings are attached to a standard scallop-shell shaped tailpiece using standard loop-end strings. The ukulele side has a regular uke bridge glued to the top and the strings are attached by tying a knot and hooking the string in a slot cut into the bridge. 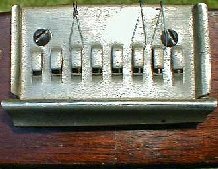 The tuners are also standard; most instruments have wooden friction uke tuners, while others have metal friction tuners. All have geared mandolin tuners, 4 to a strip. All but one of the half dozen or so Turnovers I have seen were Style 1's, entirely made of mahogany, with rosewood fingerboards, and no peghead overlays. There is a soundhole for each top, with black/white purfling for each; the photos clearly show that they face one another, the effect being that of a hole all the way through the instrument. Predictably, the sound is rather "thin". There was no binding around the body, no position marker inlays, and violin-type friction tuners for the uke side. Ads offered several grades, using different top wood and decoration. The Turnover Style 3 with spruce top, pickguard, metal uke tuners, and later patent stamp is the only one known. The J.A. Handley ad, is from November, 1924. 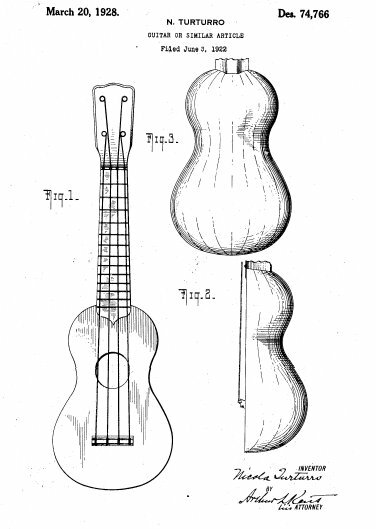 Nicola Turturro had other patents, of them the best known was applied for in 1922 and issued in 1928, for the instrument he named the "Peanut Uke", which you can see on exhibit at The Met in NYC. 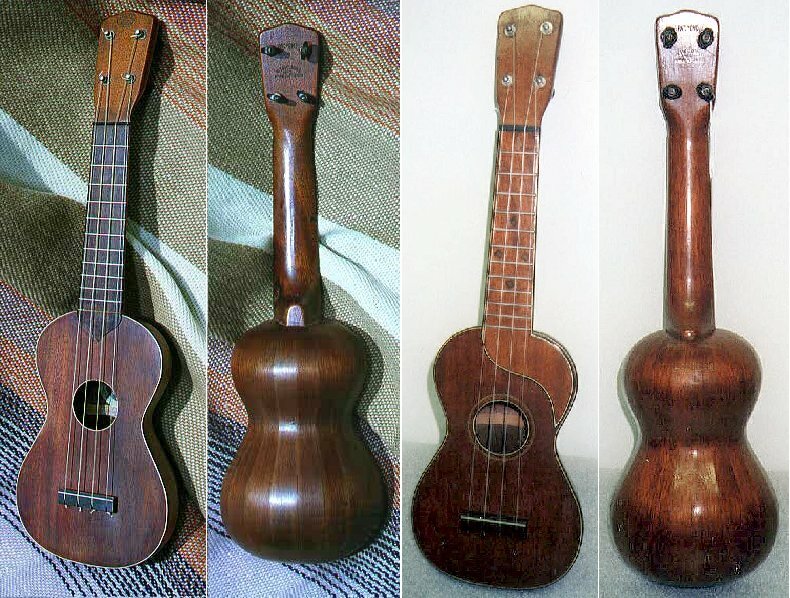 Here are pictures of another Peanut Uke model (left), and another view of the Met's Peanut Uke (right). 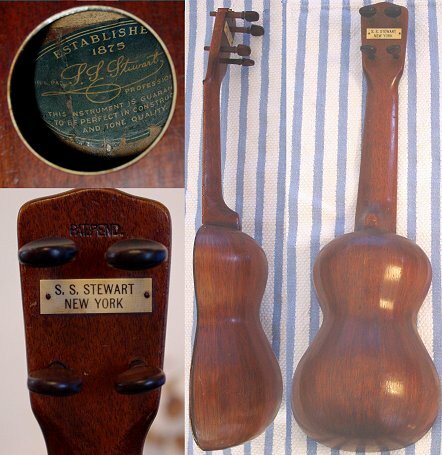 Another Peanut Uke has been seen with an S.S. Stewart, New York label and name plaque. One instrument that gives evidence of a connection between Turturro and Calace is the Lyre or Harp Mandolin he patented soon after arriving here, in 1903, an example of which can also be seen in the Met exhibit. In the photo below right, there are two "Turnovers" and one "Peanut Uke" plus a banjo uke of unknown origin, perhaps a Gibson UB-1. 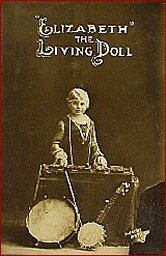 The midgets called themselves "The Doll Family" and were well known in vaudeville and in the circus in the 20's and 30's. The man is Harry Earles, probably the most famous midget actor of his day, who starred in Freaks and The Unholy Three with Lon Chaney. At least 2 of the women are his "sisters" from Freaks as well. Contributors to this article include Chris Davis of Catch & Release, Robert Wheeler of Ukulele Consciousness, Chuck Fayne, Jim Garber, Peter Stuart Kohman, Gary Shelton, Nicholas Turturro, J. Michael Young, and Matt Umanov.